As if I needed an excuse to get out on the bike! 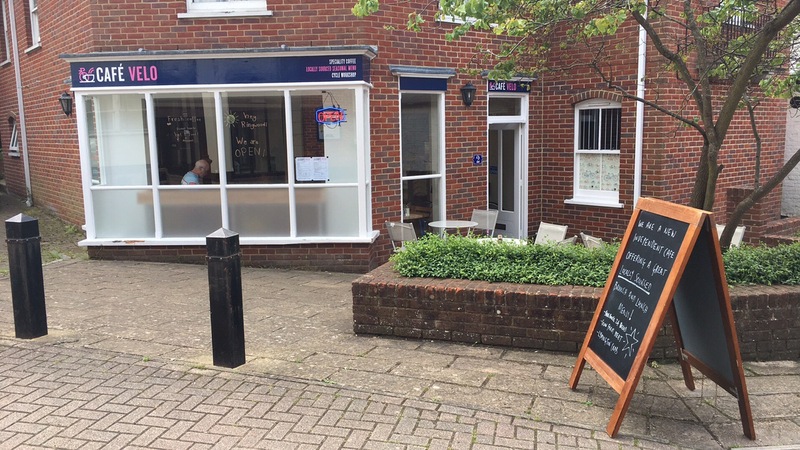 There’s a new Cycle Cafe in Ringwood. Cafe Velo opened on the 23rd of May and is a most welcome addition to the cycle cafes in the local area. Yes cafes plural, we now have 4 within a ten mile radius of Bournemouth! Spoiled for choice. Cafe Velo is the passion of owners Andy and Naomi Boyd having moved to the area 6 months ago. Driven by a love for the area and desire to make coffee, cycling, and the cycling community a bigger part of their lives. It was great to chat to them both today, they are a lovely couple. The cafe itself boasts an immaculate rebuild, a far throw from the American style diner that was in the premises beforehand, featuring pallet wood cladding, pendant lighting, and separate bicycle workshop and storage areas. A big TV shows the latest racing action with the Rapha Nocturne being today’s highlight. Cafe Velos breakfast menu is a mix of the typical smashed avocado on toast alongside some nice full breakfast and your choice of mix and match ingredients on toast. Mustn’t forget the porridge or granola! For lunch they have baguettes and sandwiches, burgers, crab cakes, and salads. Not to mention an ever changing specials board. Coffee is a big thing in the cycling world (how else would you get that kind of performance boost whilst keeping it legal!) and they have it in spades at Cafe Velo. It was pre midday so I almost went for a cappuccino but decided flat white at the last moment. I wasn’t going to have a pastry after all……. It was a nice brew showing off their ability and investment in the machinery! Cafe Velo serves Bournemouth based coffee roasters South Coast Roast coffee and I opted for the house blend single fin. After a great chat with the owners I had polished off two cups! and was ready to ride home at tour speeds! Despite being Cafe Velo’s first month it looks like they have been doing it for ages (except a distinct lack of pedal and tyre marks of the walls and floors!) and there are plans afoot to bring even more to the business. Repairs and accessory sales being one for the near future, with workshop area already set out, and cycle maintenance and education classes. Another benefit Cafe Velo offer is 10% discount for every cycle club member or cyclist in club kit so get out there with your mates. To see cycling growing to the extent where we have viable business opportunities like Cafe Velo makes me feel good about the world! and helps subdue the despair I feel when I hear that Bournemouth is the most congested town in the UK and one of the most unsafe for cycling. This town needs to wise up and embrace cycling not just as a hobby but as a genuine method of transport, we could be leading the way if we all put our heads together, and cycling hubs like Cafe Velo and Velo Domestique are slowly helping to change things. Long live the cycle cafe! Lovey refit, great coffee, tasty menu. Just the right hint of Giro pink! Cafe Velo is located in Star Lane in Ringwood, just behind the Furlong Centre.